Fifty something mom and independent contractor trying to decide what to be when I grow up. So many choices, so little time. I did some work related travel last week and it turned into a bit of an adventure. Check it out. OH!!! I feel your pain. 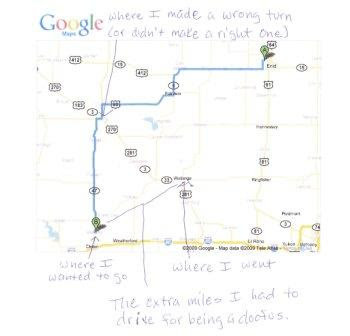 This road tripping job stuffs can get tasking when you get lost.. Somehow the other day instead of going to alva, I ended up west of Alva. That was a blast. trev - Yeah, isn't it fun wasting time and gas? I have to go over by Alva next week. Wish me luck! I was a career mommy and volunteer for about 23 years. Now I work with my husband in his consulting business, am also an independent contractor, and continue to volunteer. Hopefully, we will also have more time for travel in the not so distant future. Would You Please Repeat That?